Last summer I accompanied some college students doing educational and health care outreach at migrant farmworker camps. They were generally dismal places, ill-maintained and no place I’d ever want to spend the night. It was mid July. Hot. I’d been traveling all day with Julie King and Danny Guzman-Ramos, interns with Student Action with Farmworkers, trying to register young workers for ESL classes. After several hours of hopscotching the South Carolina blacktop they had managed to register a grand total of one, living in a trailer with failing siding and a yard littered with garbage. This was a familiar site. The front porch of another camp was strewn with beer cans, dirty laundry, and filth. At another place, a courteous but uninterested farmworking mom spoke to Danny through a screen door with holes big enough for birds to get through. On other days I had seen much worse. Fatigued and growing miserable in the heat, Danny and Julie decided to ditch the rest of their leads. They would go instead to a peach grower’s camp where they had already registered the workers for classes, this time to conduct an interview for a documentary project. The decision changed everything. For the first time that day they seemed genuinely excited and I soon found out why. We rolled to a stop at the end of a long gravel road, the last few pebbles crunching under our wheels. The expanse of grass surrounding the squat white building was the first I’d seen that qualified as an actual lawn. It wasn’t fancy but had clearly been mowed. And there wasn’t a spec of litter in sight. Danny and Julie were met by a pair of men with smiles that wrapped their weather-worn faces. I couldn’t follow the rapid Spanish but the body language was clear: These people were happy to see one another. 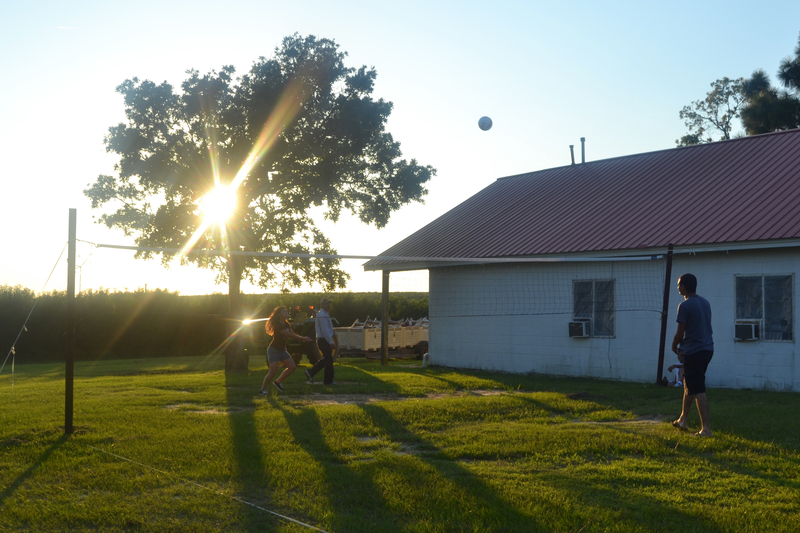 While Danny went inside to recruit someone to interview, Julie headed to the volleyball net. Volleyball? Soon she was punching the ball to a guy on the other side, who lost sight of it in the glare of a setting sun now falling toward peach trees surrounding the camp. He laughed. I saw things here I hadn’t seen at other camps: A pair of clean washing machines on a covered porch—they looked new. Rows of clothes lines, draped with shirts and pants, were rocked in unison by a warm breeze coming off the orchard. One worker sat on a tractor, watching the orange sun now kissing the tops of the peach trees, enjoying the simple passage of time in a gorgeous setting. The interview went off without a hitch and was followed by friendly banter inside a screened-in porch where I took in the surroundings: Clean tables. A swept floor. A bright clean kitchen with a professional stove—a Viking, the kind you see in restaurant kitchens. Why was this camp for migrant farmworkers so nice when so many are such filthy hovels? This was a camp for workers on H-2A guest worker visas. The government requires housing at these camps to meet certain standards. I’m told these standards are not always enforced, but here I imagine the grower was well in compliance and maybe then some (I doubt the program requires Viking stoves and volleyball nets). The H-2A program is not without controversy. Detractors say it doesn’t address the much bigger problem of poor living and working conditions for undocumented workers (only 10% or so of migrant workers are here on H-2As) and even its proponents decry the H-2A bureaucratic complexities. I’m still learning about the program and don’t have a strong opinion. I just wish every migrant farmworker in America could come off the fields at the end of a day to a place like this.